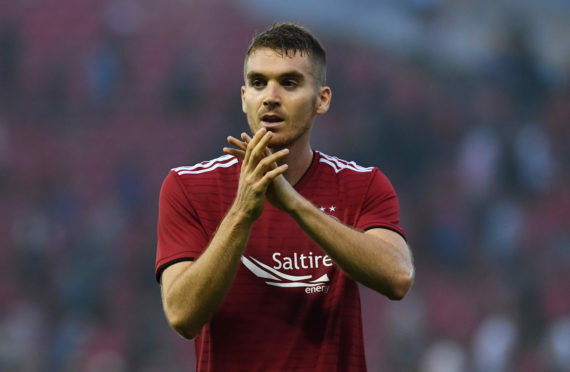 Tommie Hoban made his Dons debut against Burnley last week. Victory over Burnley tonight would give Aberdeen the opportunity to become heroes. That is the view of Tommie Hoban, who is one of those with the chance to make a name for himself by securing Europa League progress at Turf Moor. The Dons are quietly confident of getting a positive result in their second leg, after matching the Clarets at Pittodrie a week ago. Hoban was pitched into that game for his debut 24 hours after signing and the importance of tonight’s game is not lost on the on-loan Watford defender. He said: “We have come up against a team that did so well in the Premier League last season. The manager said we will become heroes if we win and it will be a match that will be remembered for a long time. Everyone is buzzing for it. “Burnley had a great season last year and to finish where they did in the Prem was really special. But we have gone out there and really matched them and could have come away with a win. The tie pitches Hoban against his former manager Sean Dyche, who he worked with during his time at Vicarage Road. He is impressed with how Dyche has progressed in his career and remembers the help he gave him as a youngster. Hoban said: “I worked with him very briefly, just as I was breaking into the first team he moved on. He was someone that was very helpful to me early in my career, being a defender as well. When I used to train with the first team he’d give me tips and help to make myself a better player. “I was in the youth team at the time but over a two-year period, I trained with the first team a bit and played a few games. He’s done fantastic for himself – what Burnley have done the last few years is incredible. At that stage he was just starting out and did very well with us. It’s no surprise to see him do what he’s done.